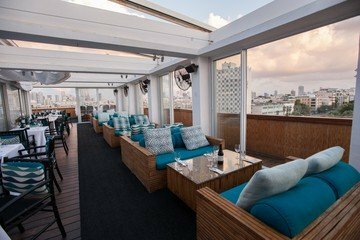 Ciela Rooftop Lounge is located on the 7th floor (rooftop floor) of The Alexander luxury boutique hotel in the heart of Tel Aviv, overlooking the magnificent views of the sea and the city. 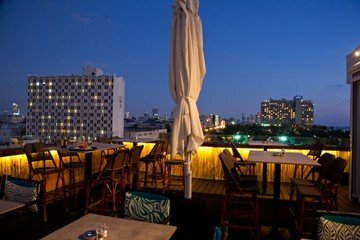 The Alexander hotel is located in a very central, but yet quiet area, just between the bustling port and hotel row. In order to create a pleasant and friendly vibes on the restaurant, Ciela offers a variety of seating. Lounge-style seating on fabric draped couches, alongside bar seating and conventional seating at tables for 4. The inside part of the restaurant is having a relax atmosphere and charming design. On the outside part, the guests will enjoy a terrific view of the mediterranean sea. 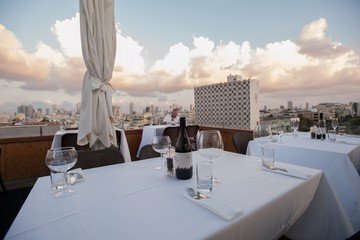 Ciela holds Kosher kitchen that will serve you the best of the Israeli cuisine. The lounge holds events up to 130 guests. It offers a perfect location for private corporate events. No matter if you are organising a conference or a promotion for a new product, a private party or a special dining, Ciela offers an excellent solution for that.